The smart home is a product category marked by hype and unfulfilled promises. Now, entrepreneurs and investors think improved technology will get consumers to finally bite on home automation. Earlier this month, Savant Systems said it raised $90 million from private equity firm Kohler Kravis Roberts (KKR) to expand its product line and ramp up marketing. The deal is the latest sign that technology companies believe they can make home automation appeal to middle-class consumers with cheaper hardware and user-friendly apps. The CEO of Savant Systems is William Lynch, the former CEO of Barnes & Noble, who resigned last year after disappointing performance in its Nook e-reader business. After leaving, he started looking for another consumer technology product category that would affect how people live. 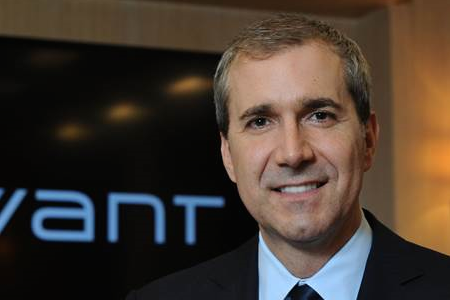 He found Hyannis, MA-based Savant Systems and, after a series of discussions with the company founder, become CEO earlier this year. The company, which was founded in 2005, continues to have operations in Hyannis and New York City. Until now, Savant Systems’ products have been installed in the homes of the well-heeled, providing a control system for home entertainment, lighting, security, and climate. Installations costs start between $10,000 and $20,000. With the investment from KKR, which also invested in home music provider Sonos, Savant plans to start marketing to the “middle market” and build out its product line, Lynch says. “We see an opportunity to take our software that’s been in castles, yachts, bigger homes, and luxury domiciles and bring it more into the mainstream with more affordable price points,” he says. Its first product uses a Mac mini as a hub for other wireless sensors and controllers to connect into. Consumers use an iOS app to essentially program the house. You can schedule the shades to come up 30 minutes before dawn on Saturday, turn up the thermostat in the kitchen, and start playing music from your favorite artist. Previously, creating these types of “scenes,” or schedules, could only be done by professional installers, Lynch says. The company has now built another product based on a less expensive Linux-based controller device, which will allow consumers to start with its home automation system at $1,599. That price does not include more advanced features, such as a multi-room home audio system and the required installation service fee. Although he doesn’t rule out selling through retail channels, Lynch says the most effective way to sell smart-home tech is through installers, who act as consultants to consumers. But in the past year, the likes of Staples and big-box retailers have started selling home automation gear. These products typically include a wireless hub that connects to security cameras, door and windows sensors, thermostats, and the like. The idea is that consumers can install this equipment themselves, rather than hire a professional installer, and add new connected products over time. Often, consumers buy smart-home technology for improved home security, according to Park Associates. A parent at work can put a sensor on the garage door and turn on the webcam, for instance, to see that a child has come home from school. After home security, whole-house entertainment systems and energy efficiency tend to be other reasons people buy into home automation. There are several startups trying to bring down the cost of smart-home gear and simplify installation. During 2012 and most of 2013, there were 56 venture deals worth $468 million in home automation, according to CB Insights. And the pace appears to be picking up: San Francisco-based IFTTT, which makes software for connecting Web services and connected devices, such as Nest thermostats, last month raised $30 million from Norwest Venture Partners and Andreessen Horowitz. In July, San Francisco-based Spark Labs raised $4.2 million to create what it calls an operating system and hardware development kit for the Internet of things. Zuli, which makes smart plugs that allow people to control plugged in appliances and lights, raised $1.65 million in August. Big tech companies are pushing into home automation as well. Samsung last month bought startup SmartThings, which sells a kit that includes a hub, smart plugs, and other sensors for home automation. Nest, which was acquired by Google for $3.2 billion, has released a smart thermostat and smoke detector is expected to release more home automation gear. On a technical level, one of the most significant changes in home automation in recent years is the emergence of smartphones and wireless hubs. First attempts at smart-home technology focused on stand-alone appliances, such as the Internet-connected refrigerator or dishwasher, which have yet to take off or show clear benefits in terms of convenience. Now with smartphone and tablet apps, tech companies can give consumers an easy-to-use interface and can connect multiple devices through dedicated wireless hubs. Savant’s Lynch says home automation will become almost “like a utility” that will allow people to secure their home, improve the energy efficiency, and generally enjoy it more. He won’t predict that smart home technology sales will rocket this year, but he’s convinced that it will follow the cost curve of most emerging technology. “We see it happening. Adoption of consumer technologies take longer, but once they go, they go,” he says.